LBG REAL ESTATE 80 • SHOPPING CENTER BUSINESS • September 2018 sumer spending ranks the highest at $323 billion. With figures like these, not to mention a JC Penney store set to close, LBG decided to pivot when it came to rebranding the Shops at Hilltop. "We're not only working to fill a much-needed void in an underserved West Coast marketplace, but we are cre- ating unique synergies between our core consumer constituency and an expanded tenant mix via a culturally sensitive remer- chandising strategy that is designed to ef- fectively meet our customers' needs and their wants," Lundin says. "It is these syn- ergies that will result in an impressive end product where the Shops at Hilltop will be defined as an all-inclusive destination that offers a well-rounded consumer expe- rience — one that instantly differentiates the center from its regional competition." This new strategy started with the an- nouncement that leading Asian super- market chain 99 Ranch Market would anchor the center along with existing names like Macy's, Sears, Walmart and 24 Hour Fitness. The market will feature an 11,000-square-foot food court that will sit at the pinnacle of Hilltop's trans- formation from an enclosed mall to an all-inclusive, multi-cultural shopping and entertainment destination. Though the center's cultural roots may be inspired by far-off lands, LBG is once again going local, sourcing tenants within the San Francisco and East Bay communi- ties that its shoppers have grown to know and love. 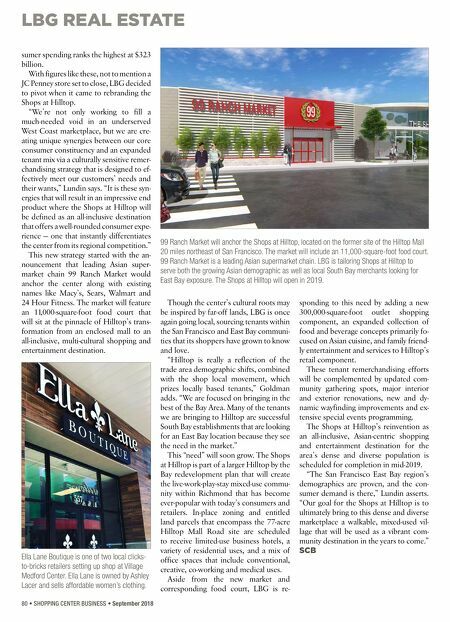 "Hilltop is really a reflection of the trade area demographic shifts, combined with the shop local movement, which prizes locally based tenants," Goldman adds. "We are focused on bringing in the best of the Bay Area. Many of the tenants we are bringing to Hilltop are successful South Bay establishments that are looking for an East Bay location because they see the need in the market." This "need" will soon grow. The Shops at Hilltop is part of a larger Hilltop by the Bay redevelopment plan that will create the live-work-play-stay mixed-use commu- nity within Richmond that has become ever-popular with today's consumers and retailers. 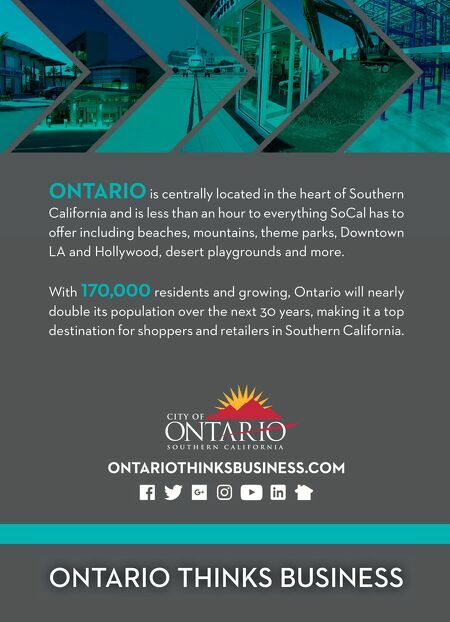 In-place zoning and entitled land parcels that encompass the 77-acre Hilltop Mall Road site are scheduled to receive limited-use business hotels, a variety of residential uses, and a mix of office spaces that include conventional, creative, co-working and medical uses. Aside from the new market and corresponding food court, LBG is re- sponding to this need by adding a new 300,000-square-foot outlet shopping component, an expanded collection of food and beverage concepts primarily fo- cused on Asian cuisine, and family friend- ly entertainment and services to Hilltop's retail component. These tenant remerchandising efforts will be complemented by updated com- munity gathering spots, major interior and exterior renovations, new and dy- namic wayfinding improvements and ex- tensive special events programming. The Shops at Hilltop's reinvention as an all-inclusive, Asian-centric shopping and entertainment destination for the area's dense and diverse population is scheduled for completion in mid-2019. "The San Francisco East Bay region's demographics are proven, and the con- sumer demand is there," Lundin asserts. "Our goal for the Shops at Hilltop is to ultimately bring to this dense and diverse marketplace a walkable, mixed-used vil- lage that will be used as a vibrant com- munity destination in the years to come." SCB 99 Ranch Market will anchor the Shops at Hilltop, located on the former site of the Hilltop Mall 20 miles northeast of San Francisco. The market will include an 11,000-square-foot food court. 99 Ranch Market is a leading Asian supermarket chain. LBG is tailoring Shops at Hilltop to serve both the growing Asian demographic as well as local South Bay merchants looking for East Bay exposure. The Shops at Hilltop will open in 2019. Ella Lane Boutique is one of two local clicks- to-bricks retailers setting up shop at Village Medford Center. Ella Lane is owned by Ashley Lacer and sells affordable women's clothing.